Alan Chong Lau is a poet and painter exhibiting his art locally at ArtXchange Gallery in Seattle, Washington. RYAN! 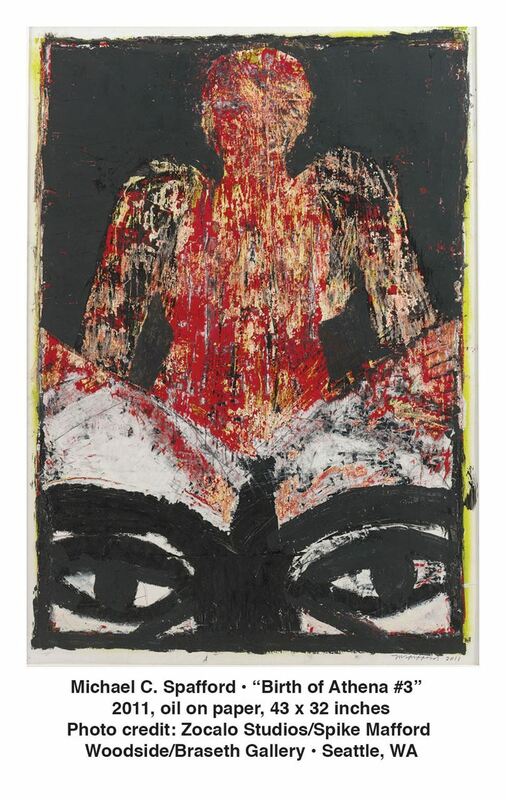 Feddersen reaches out both geographically and conceptually for the intriguing show “In Red Ink” at the Museum of Northwest Art in La Conner. She breaks down boundaries of media, chronology, and above all clichés. John Feodorov’s “Dance of the Colonizers,” made up of clips taken from the 1949 film, “On the Town,” exposes the racism of Hollywood as sailors team up with “girls” at the Museum of Natural History in New York City to mimic “savages. 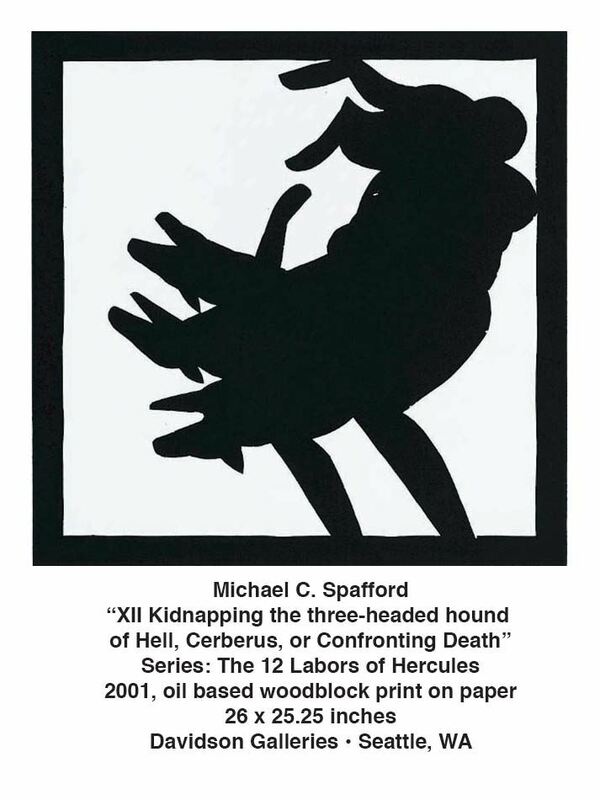 Caricature of caricature frequently appears in this exhibition. Andrea Carlson whose affiliation is the central Canadian and East Coast Anishaabeg/Algonquin, sends up the absurd cowboy and Indian stereotypes of dramatically leaping horses and men. 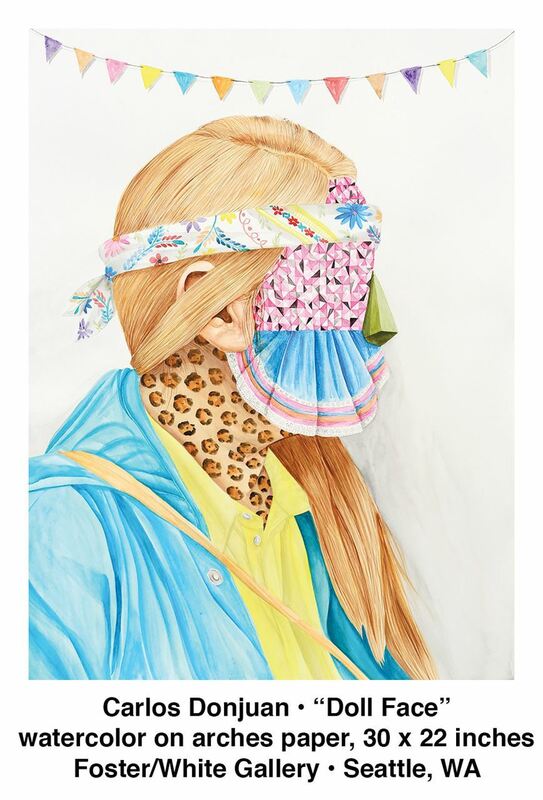 Her style of pseudo cartoon, with heavy outlines and brilliant color, underscores her parody of popular culture. Natalie Ball literally cuts up clichés in her large collaged art work that include river rocks, crow feathers, wool, and lodge pines, an intentional use of traditional Indigenous materials, along with European style painting, charcoal and oil stick on canvas. The central figure appears to be an “Indian” collaged and sewn together from mismatched pieces. It has the expressionist directness of a work by Jean-Michel Basquiat. 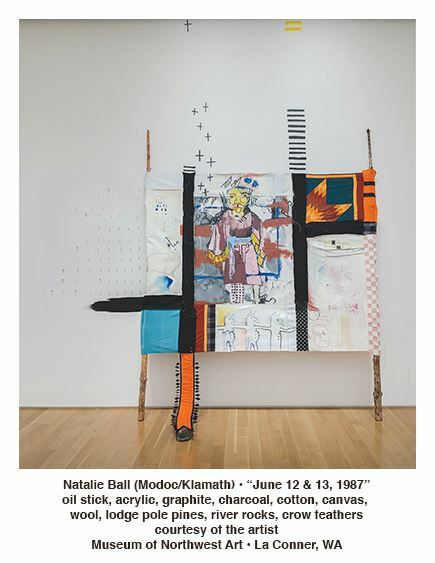 Also collage-like and humorous, but entirely painted, is the series of works by Ka’ila Farrell-Smith (from the same tribal affiliation as Natalie Ball, Modoc, Klamath) with her three large “bundle” paintings painted on plastic exhibitionbanners. The term “bundle” is applied to various entities “Time,” “Chief,” and “IAIA Students.” IAIA stands for Institute of Indian Arts in Santa Fe, a renowned Indian Art School. A bundle of sticks appears below them, amusingly transposed as the group of students who themselves echo, in their clothes, a mix of the contemporary and traditional. 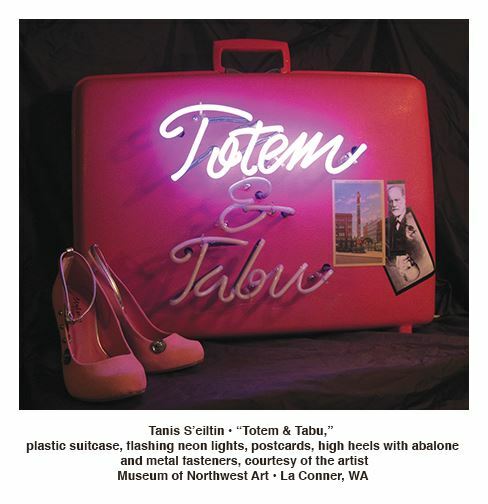 Northwest artists Tanis S’eilten and Joe Feddersen both provide humor with less caricature and more politics, S’eilten by her crazy medium in “Totem and Tabu,” a Freudian book title, with pink shoes, pink suitcase, and neon referring to the stereotype of Native sexuality. She inserts the rip off of Native cultures with an old postcard of the stolen totem pole that came to Pioneer Square as a literal totem. Joe Feddersen’s show stopper, “Charmed,” a wall of symbols cast in glass, gives us a delightful mix up of high tension wire towers, petroglyphs, “teepees” and various other “symbols” that can be read as either caricatures or real objects. 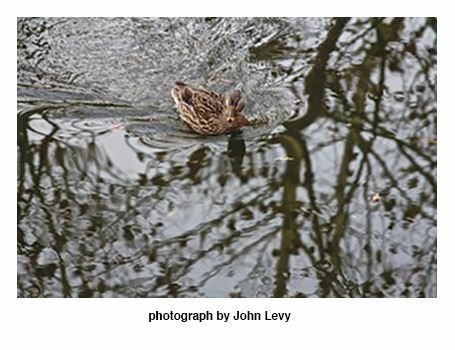 On a serious note, John Feodorov’s second group of works reinterpret both media and content. Weaver Tyra Preston created special plain white Navajo rugs for him on which he painted with some trepidation given the rugs’ powerful importance as metaphor of land and culture. The four “Desecrations,” refer to pollution on the land: a coal plant, pipe lines, a yellow radiation house and fracking cracks in the earth. RYAN! Feddersen herself has a rye sense of humor, an impatience with historical stereotypes, a deep commitment to redefining what we mean by contemporary Indigenous art, and a generous spirit that reaches out into the community. Her show reflects these qualities. Curated in collaboration with Chloe Dye Sherpe of the Museum, it gives us a refreshing new point of view, while also making us think about the history of indigenous misrepresentations. We are so fortunate to have contemporary Native artists who speak to both their heritage and to our contemporary world about the state of the earth and the colonialism that has led us to where we are now. Humor traditionally masks politics and urgency. “In Red Ink,” a term that can mean emergency, editing out, deficits, and highlighting, all at once, gives us a chance to understand where we are now and where we can go, with the guidance of these creative artists. Speaking of that creativity, look out for “yəhaw̓,” an exhibition of 200 indigenous artists sponsored by the Office of Arts and Culture and the Na’ah Illahee Fund, opening at King Street Station in January 2019. We all think we know the photographs of Edward Curtis from a handful of frequently reproduced images that offer us romanticized, nostalgic views of Native Americans from the turn of the twentieth century, a time when Native peoples were thought to be vanishing. Curtis set out to preserve their traditional way of life, when it was already almost destroyed by assimilation efforts by the US government. 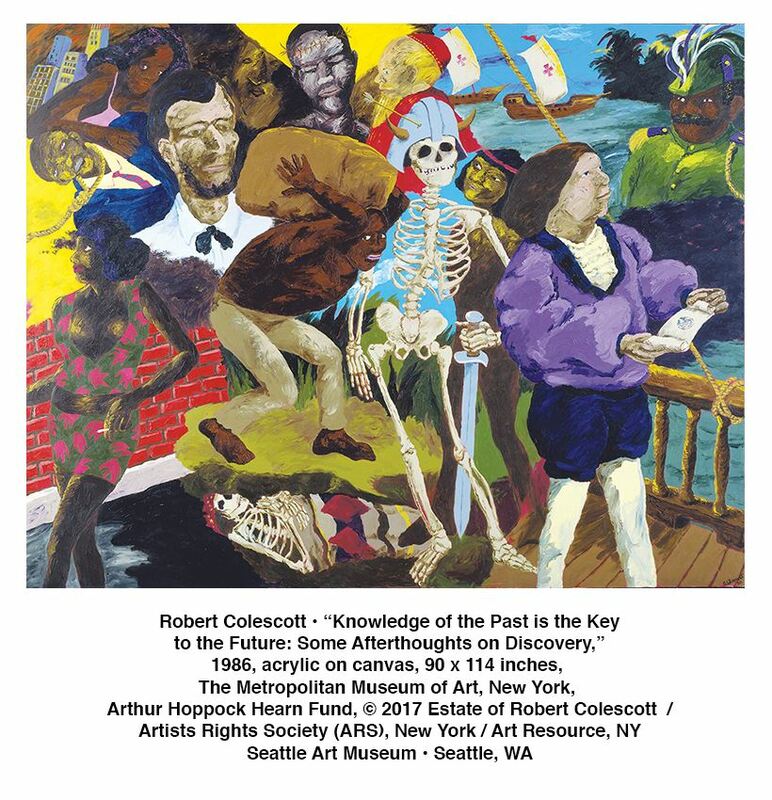 This summer, on the 150th anniversary of Curtis’s birthday, the Seattle Art Museum along with many nearby museums and cultural centers, is reexamining his work, his legacy, and his relationship to contemporary native culture and art. At the entrance of “Double Exposure” at the Seattle Art Museum, a voice in Lutshootseed and English welcomes us, as we are immersed in the stunning installation by Marianne Nicholson. 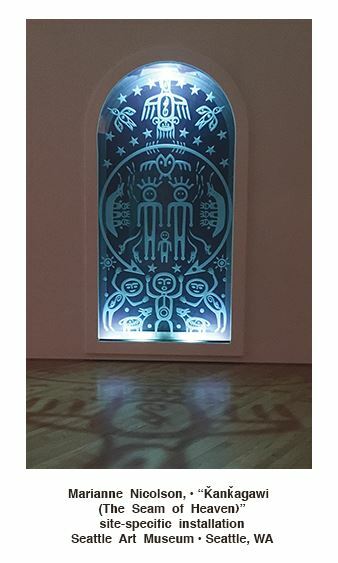 Two back to back glass panels, etched with native imagery, and a light inserted between them, cast shadows on the floor. Ḱanḱagawi (The Seam of Heaven), metaphorically presents the Columbia River, in its beauty and disruptions. The name means “sewn together.” The two pieces of glass suggest the breaks caused by dams and borders, while the light and shadows offer possible healing as the treaty between Canada and US comes up for renegotiation. 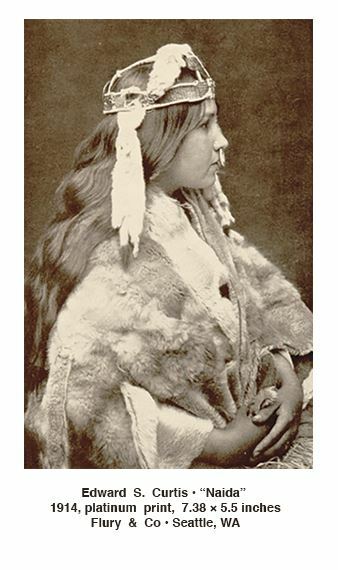 “Double Exposure” features 150 historical images by Curtis, a selection from various chapters of The North American Indian, created between 1907 and 1930. The book is available online at http://curtis.library.northwestern.edu and well worth reading even a short excerpt from the detailed information that originally accompanied the photographs. 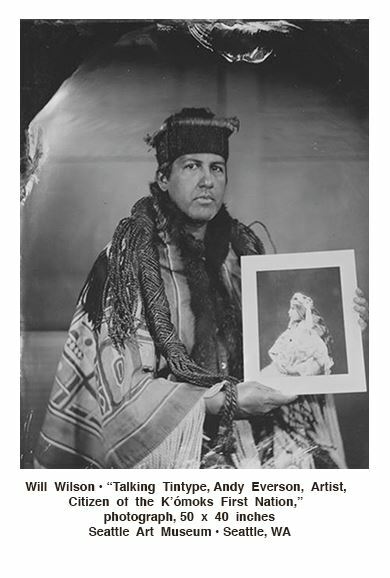 Curtis created 40,000 photographs of more than 80 tribes, but they were meant to be seen in the context of tribal history, customs and much more. His accomplishment is staggering. His assistants also made 10,000 wax cylinder audio recordings of music, a few of which we can hear in the exhibition. We also can watch his pioneering film from 1914(!) “In the Land of the Headhunters” starring Naida as the bride. Her descendant holds the Curtis photograph in Will Wilson’s tintype. The stunning photogravure images, created on copper plates, glow on the wall. We revel in Curtis’s eye for composition, and his technical facility with a complex photographic process. Curator Barbara Brotherton offers detailed and nuanced labels. In some cases these images are posed works that followed Curtis’s romantic perspective, in others they document historical practices that had mainly been passed on through oral traditions. For more immersion into Curtis’s technical prowess, Flury & Co, our local Curtis specialists offers “Edward Curtis Photographs in Copper” (On view through September 30) featuring 30 copper plates, never before displayed, from the original North American Indian publication. Flury & Co is a like a small museum in itself. 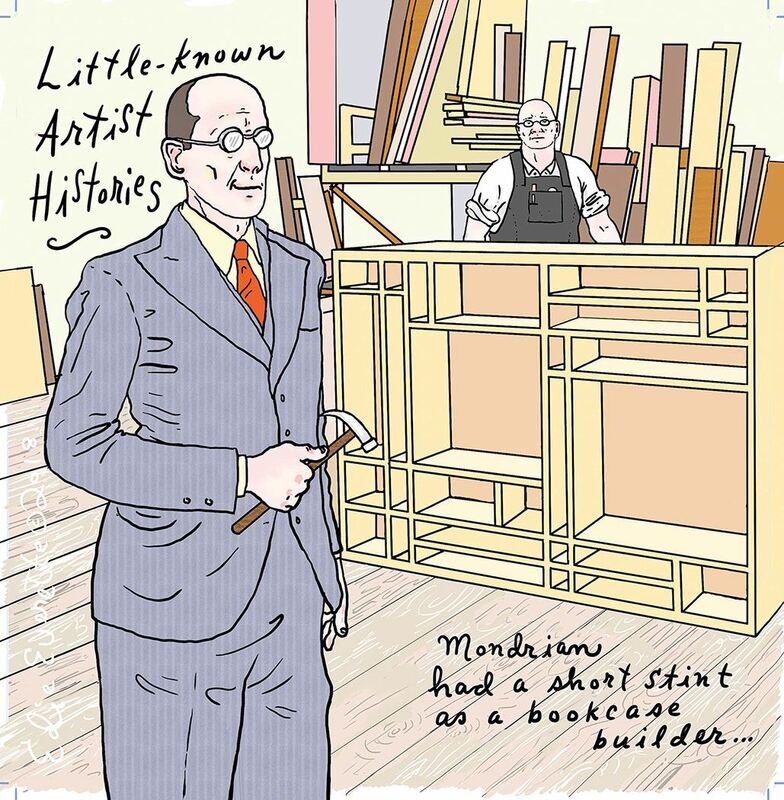 The family have rights to the sale of Curtis prints and plates, memorabilia and manuscripts, acquired directly from the artists descendants living in Seattle. In “Double Exposure,” we also can experience native commentary on Curtis. First, there is a new way to insert videos into an exhibition, the app “Layar.” As we scan a Curtis photograph of a canoe race, a video appears with an interview with a 16 year old youth who participates in contemporary canoe journeys. He speaks vividly of the endurance required to paddle a canoe as a team for 10 hours straight. This dramatically layering of the Curtis photograph with contemporary interviews by native speakers makes a dynamic intersection of past and present. Will Wilson’s large tintypes come alive as we scan them and hear from the contemporary person photographed, a poet, a state politician, an artist, a filmmaker, a drummer, a dancer. Tracy Rector’s experimental films record contemporary natives speaking of the threat of environmental contamination as well as the preservation of rituals and traditional practices. 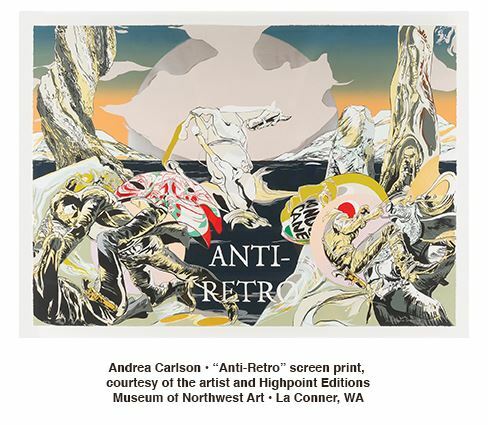 The exhibition at the Seattle Art Museum is one part of “Beyond the Frame: Being Native” a collaboration of 20 native groups and cultural institutions reexamining Curtis in a contemporary context. 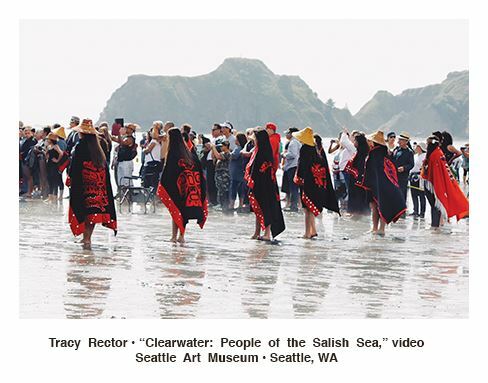 Just up the street from the Seattle Art Museum, the Seattle Public Library offers “Protecting the x əlč: Indigenous Stewardship of the Salish Sea” (On view through August 15). It has two parts; the first room emphasizes Curtis’s photographs of traditional practices such as fishing and harvesting (including historical artifacts); the second room presents contemporary life as in the flourishing canoe journeys, the success of the dam removal on the Elwha River, and contemporary resistance to industries, such as the Lummi defeat of a coal terminal on Cherry Point. Concluding the exhibition is a video with Brian Cladoosby president of the National Congress of American Indians and Chairman of the Swinomish Indian Tribal Community, speaking about their pioneering plans to resist the effects of climate change. For a complete list of the exhibits and events affiliated with “Beyond the Frame: Being Native” as well as information on contemporary native life see the website. https://www.beyondtheframe.org. Look out in particular for the exhibition of 20 contemporary native artists, curated by RYAN! Feddersen with Chloe Dye Sherpe, “In Red Ink,” at the Museum of Northwest Art in La Connor that opens on July 7. Also don’t miss RYAN! Feddersen’s amusing installation at the end of “Double Exposure” in which we take on the role of “post-human” types such as “Humans of the Glass Offices” and “Vanishing Human Types: People of the Outdoors,” echoing Curtis view of natives as the “vanishing race.” It’s online at http://posthumanarchive.site.seattleartmuseum.org. We are fortunate here in the Northwest to have a vibrant contemporary native art and cultural flowering that is gaining increasing visibility throughout our region thanks to the collaboration of traditional institutions with committed and articulate tribal groups in Washington, Oregon, and Canada. Keep an eye out for satire in the Seattle Art Museum’s new exhibition “Figuring History.” Robert Colescott, Kerry James Marshall, and Mickelene Thomas all share a deep irreverence for traditional Euro American history as they rewrite familiar stories and turn clichés upside down and inside out. But first, immerse yourself in the sheer virtuosity of these artists. “Figuring History” the theme presented by Catherina Manchanda, curator of the exhibition and modern art curator at the Seattle Art Museum, emerges from brilliant formal games with color and space. Fortunately, because the paintings are large (in the tradition of history painting,) there are not many of them, which makes it possible to fully experience their aesthetics, their satire, and their rewriting of history. 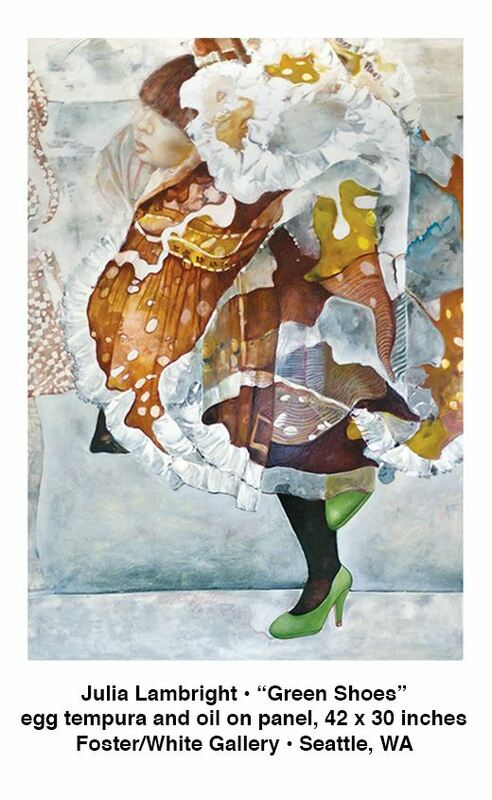 The show encompasses three generations of African American artists. Robert Colescott (1925–2009) turned to monumental figures inspired by both Leger and Egyptian art (he lived in Cairo for several years). 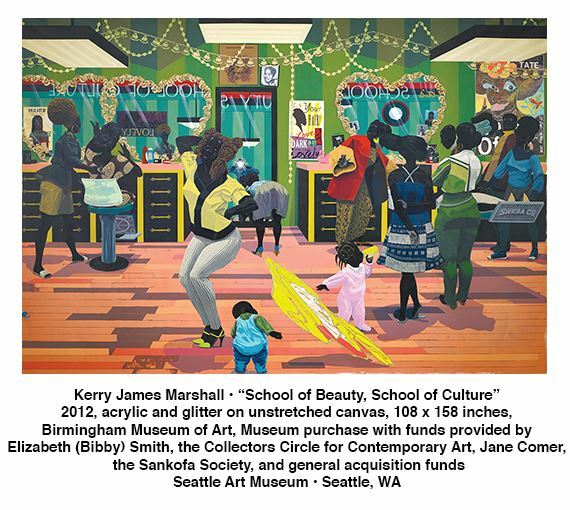 He was directly affected by the Civil Rights movement of the 1960s; Kerry James Marshall, born in 1955, celebrates middle class black life starting in the 1990s with its undercurrent of impending danger. Mickelene Thomas, born in 1971, brings us to the present moment with her assertive, no holds barred paintings of black women. Colescott’s first rewriting of history, “George Washington Carver Crossing the Delaware,” 1975, outraged many people with its repertoire of cliché black face figures filling the boat of the iconic representation by Emanuel Leutze’s “Washington Crossing the Delaware.” Intriguingly, this painting is more straightforward than much that followed. Colescott layers satire, caricature, and political and historical defiance. You can’t always decipher all of his references, as his mature style of loose, brushy, overlapping figures purposefully obscures the identity of many of his figures. Looking at “Afterthoughts on Discovery,” for example, Columbus is obvious in the foreground, a conquistador behind him, a slave, a native American, two skeletons, perhaps Lincoln, a Spanish priest, but what about the five people on the upper left. Are they identifiable, symbols? Or are they actual people? The same can be said for “Knowledge of the Past is the Key to the Future: Matthew Henson and the Quest for The North Pole,” 1986. African American explorer Matthew Henson who accompanied Peary to the North Pole in 1909, is rescued from oblivion as the central figure here. Around him are Peary, a slave, a white slave trader, a Native American, and a collection of other people including Salome presenting the head of John the Baptist, a half black half white woman, and a prostitute with bright green shoes and bag. So we wander through the painting, wondering how they fit together, do they fit together, does it matter? 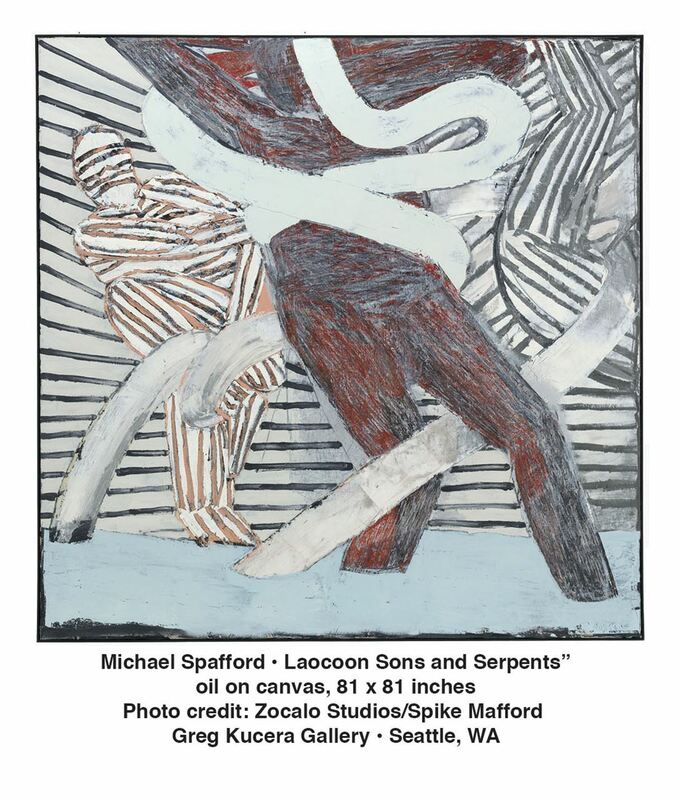 Colescott provides a virtual catalog of skin colors and types, high and low, famous and anonymous. He mixes up all the boundaries. Perhaps that is more important than a coherent single point in time. Don’t fail to spend some time with Marshall’s “Vignette” series as well: he layers seemingly simple statements of love with pointed political references. Mickelene Thomas’s glittering canvases of confident black women envelop us. Thomas, like Colescott and Marshall, sometimes redefines famous paintings. 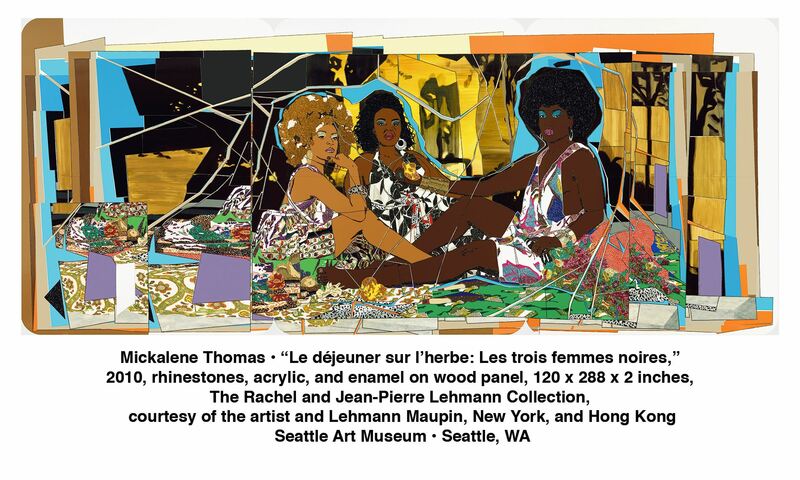 Here she transforms Manet’s “Dejeuner sur L’Herbe” into the fabulous “Le déjeuner sur l’herbe: Les Trois Femmes Noires,” 2010. Thomas’s games of space are outrageous and fascinating, they pull us in and push us out; they interrupt predictable perspectives; they adeptly juxtapose modernist squares of colors with complex patterns. While Marshall depicts a shimmering curtain in reflective glitter that closes off the space behind in “Memento V,” Thomas’s shining rhinestones copiously distributed on her paintings actually push us back. That push back in Dejeuner sur l’herbe reinforces the bold, but unavailable, women at its center . Take time with these stunning paintings, explore their complexities, and pay attention to their new histories of life in the US. It refreshes the spirit amidst the current degradations of our public politics. Susan Noyes Platt writes a blog www.artandpoliticsnow.com. She writes for local, national and international publications. Most recently she has curated several exhibitions on the subject of Migration. 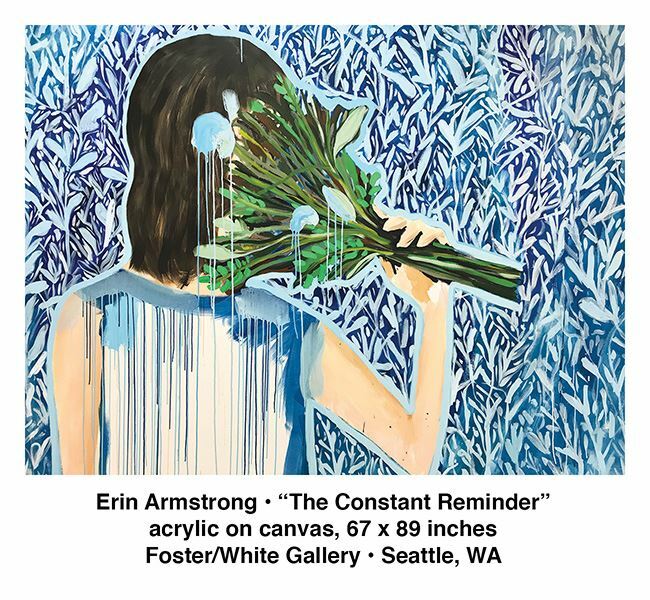 “Figuring History” is on view through May 13, 2018 at the Seattle Art Museum, located at 1300 First Avenue in Seattle, Washington. Hours are Wednesday, Friday through Sunday 10 A.M. to 5 P.M.; Thursday 10 A.M. to 9 P.M.; and closed Monday & Tuesday. 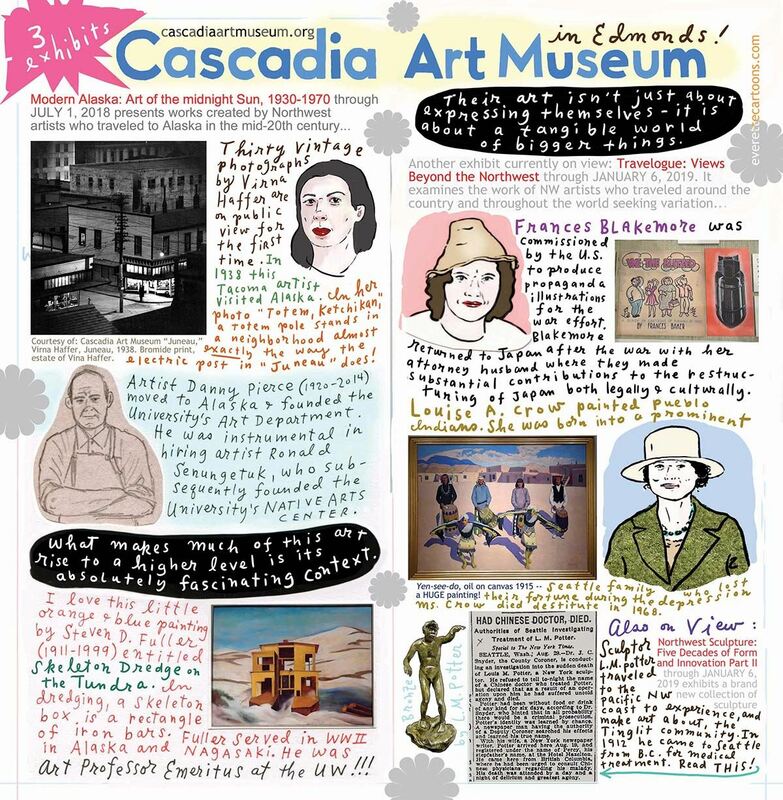 For more information, call (206) 654-3100 or visit www.seattleartmuseum.org. My friend Ken and I are on our second loop around Green Lake. It’s sunset, “the hour of truth,” Ken says. And I can tell when his truth is not so much about to surface but burst. This generally means I’m about to get a history lesson. What’s lovely is that I can practically see Ken’s wheels turning backward in time and that he’s a little surprised by how good remembering makes him feel. And that’s good enough to make me feel good, too. On election day, 2016, we walked along Waterfront Park. “I should write a song about this day,” he said. “A sad tune about misery and shortsightedness because that’s what it feels like to turn on the TV.” We laughed. Harder than we would have if anything was actually funny. Today, Ken’s lesson is about Thanksgiving. I never knew it was an English harvest celebration held the first week in October. Or that the reason why ours is on the third Thursday in November is that the U. S. Congress, in 1941, passed an act saying so. Seems the federal workers, “who live for holidays,” pointed out that October had Halloween; December had Christmas; January had New Year’s. Something had to be done about November. And the third Thursday sounded so…right. Congress agreed.“Well, why wouldn’t they?” Ken says. Next, we talk about friendships past. “It’s good to reflect before charging ahead into the new,” Ken says, thinking more about tax policy, I’m sure. But he can’t help himself. But what rushes into my mind is an old friend who-broke-my-heart. “She certainly taught me that it’s possible to keep someone close while letting them go,” I say. Ken calls this kind of attachment an emotional deep state. “When habits rule, not our brains.” But he would think of love like this, wouldn’t he? So I remind him that I’d recently spoke at my first national conference and he hadn’t even asked me about it yet. “Some friend,” I say. “You’re brave,” is all he says. We talk about cold remedies. This exchange went something like: I say my Chinese friend gives me herbs that smell terrible, and he says his sister calls chicken soup nature’s antibiotic, and I say my Filipino neighbor, Marlin, swears by slow cooked beef tongue. I love Marlin. What I know about the kind of friendship we share — how it isn’t all that easy to just do it sometimes, but do it we must — I learned from her. I spent the next couple of minutes thinking, this is Seattle, this is Ken, this is how Ken’s mind works. Ken saves the world. For me, at least. Sanelli’s latest book is A Woman Writing. She is speaking at Village Books in Bellingham, Washington on April 14th, at the Seaport Bookstore in La Conner, Washington on May 10th, and at the General Federation of Women’s Clubs International Convention held June 22-26 in St. Louis, Missouri. For more information, visit www.marylousanelli.com.